The Lakers are at a fascinating juncture. They are not quite good enough to compete for a playoff spot, but they’re also done bottoming out and their core of young players is relatively established. They have the second pick in the upcoming draft, and seeing as this will be the third straight year they’ve picked second and they don’t own their pick next year, the tank party is over. Pretty much every sign points to Lonzo Ball becoming a Laker at the draft. Ball is not only a semi-willing participant in the loudest and dumbest soap opera in sports, he’s a fascinating prospect. He’s 6-foot-6 (in shoes) with a wingspan three inches longer, so Ball has the size to play as a shooting guard. However, he profiles out as a point guard at the next level thanks in large part to his strong passing skills. He isn’t a particularly quick player, and his slow first step might not be ideal for a modern guard, but his height and vision set him apart. 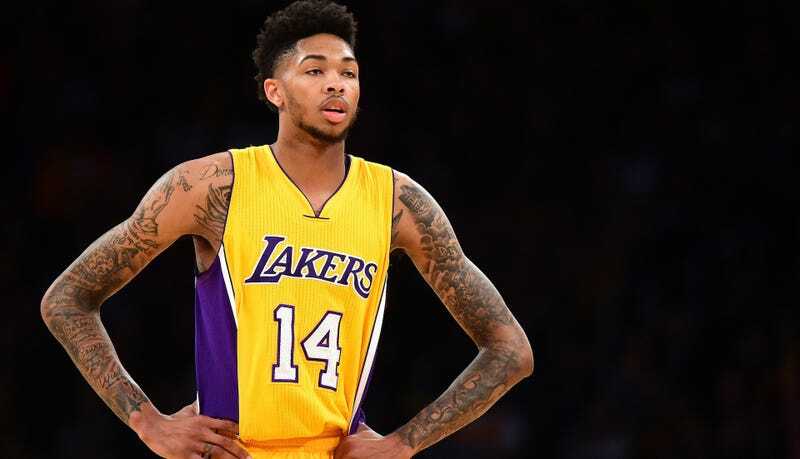 “I would say probably the only player that we would say, hey, we would probably not move is Brandon Ingram,” Johnson, the Lakers president of basketball operations said Thursday in a radio interview with ESPN Los Angeles. The Lakers should and probably will give it a shot with all three guards, since all three are very young and the rest of the team is in flux, but Johnson’s proclamation is illuminating on how the franchise sees its immediate future. Ingram wasn’t fantastic last year, but he really came on over the second half of the season as Luke Walton played him more. If he can make more threes, he could become a very dangerous scorer. Los Angeles is in good position to nab Paul George, especially considering that he did not make an All-NBA team and can’t get a super-max contract from the Pacers, yet he plays the same position as Ingram (although he might fit better as a four in the rapidly shrinking NBA.) If Johnson considered Russell a cornerstone of the franchise he would have listed him alongside Ingram or not named names in the first place. When you consider Johnson’s view of Ingram as foundational and Russell and Clarkson as fluid in concert with their draft pick situation, it becomes clear that the team either views Lonzo Ball as the truth, really want Paul George right now, or are unimpressed with some of the young players they’ve fostered. Of course, Ball isn’t a Laker yet, and for all the supposed certainty of him ending up in L.A., there are still hurdles to clear. Sorting out the guard situation is the largest. Who Ever Could This Anonymous Lonzo Ball Source Be?